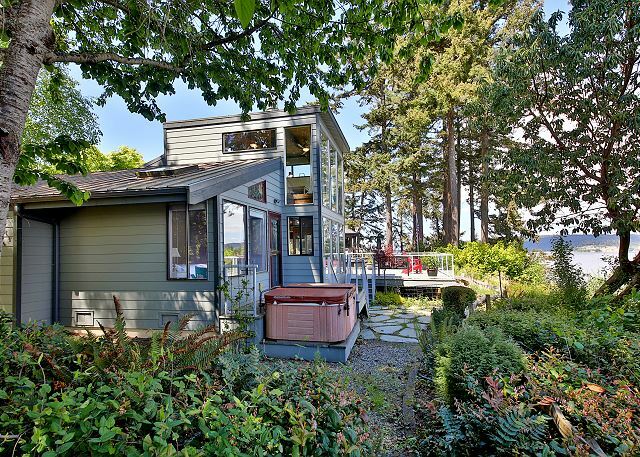 This hidden waterfront jewel offers 180 degree views of Saratoga Passage, Mt. Baker and the Cascades, beautiful sun and moon rises, access to a private community beach. Relax after a long day at the beach by soaking in the 3 person Hot Springs hot tub while gazing at the water and trees. Spend evenings curled on the sofa with a book in front of the propane fireplace or tune into your favorite shows on Netflix or Hulu on the 65" Roku Smart TV. 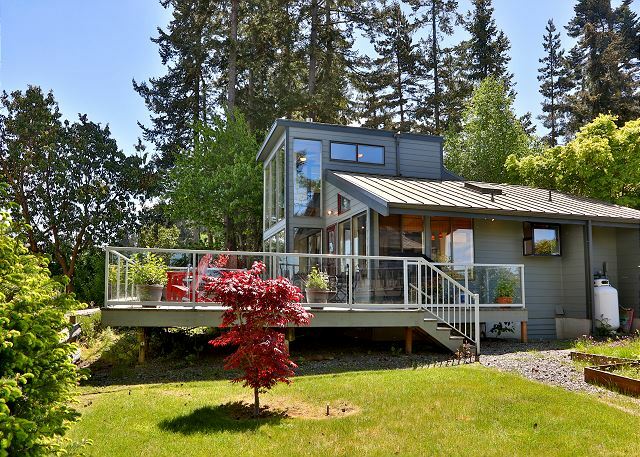 You too can experience this ultimate getaway located four miles from the town of Langley on Whidbey Island. This two bedroom home is ideal for four but can sleep six and features water views from just about every window. 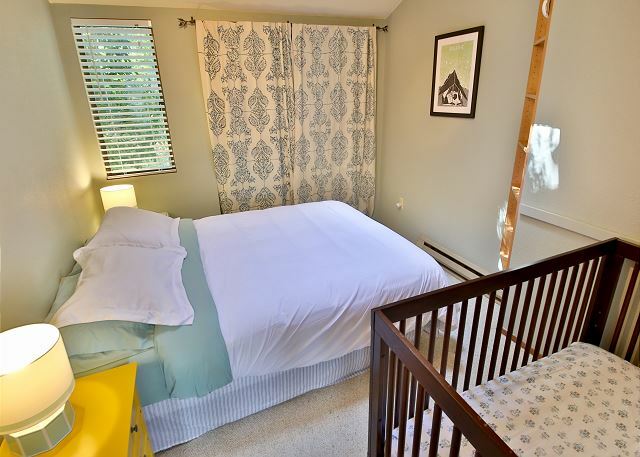 "The Casper" foam queen mattress in the master bedroom: Highest rated foam mattress in Consumer Reports. "scores impressively across the board", offering superb support to side and back sleepers of all sizes". An open loft with a sleeper sofa offers panoramic water views where migrating whales, soaring eagles, and wildlife can be spotted. While the open-concept designed home sits on a treed bluff, there is access to a quiet secluded beach to enjoy long hours of afternoon sunshine and lots of interesting driftwood, seashells and colorful stones. Other features include washer/dryer, a 65" Roku Smart TV, WiFi, propane fireplace, and ample parking. THIS HOME HAS A 4 NIGHT MINIMUM IN JULY AND AUGUST. 2 DOG MAXIMUM. Thank you for your comments. We are happy your stay on Whidbey Island was so enjoyable, even in the rain! We hope we can help you with your next stay on the Island. 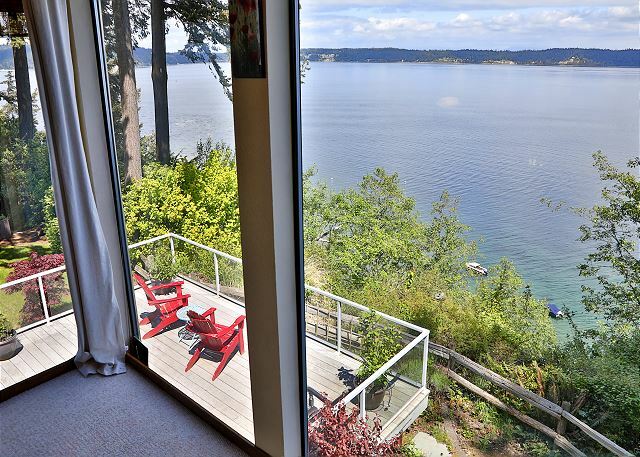 Our family of 4 women and an 11 year old girl enjoyed every aspect of this home looking east over the Sound. It was clean, well appointed, and comfortable. The view is stunning and ever changing. The walk to the beach is on the road that heads steeply down to the beach community at the waters edge. The hot tub was in excellent condition and a perfect place to watch the sunrise in the morning or the stars at night. The kitchen has all of the necessary pots, pans, utensils for cooking good meals. The dining table is a bit small for five people but we managed quite well. Thank you for your comments. We are so happy you had a "comfortable" and 'stunning" stay on Whidbey Ilsland. We hope you can help you with your next stay on the Island. This was a wonderful rental! Great views, quiet, got to see bald eagles from the deck, and it had a great, secluded hot tub off the main bedroom. We loved staying here and enjoyed breakfast and coffee at the house, and being able to just relax. Thank you for your comments. We ae happy you had a "great getaway" on Whidbey Island. We hope we can help you with your next stay on the Island. The house is beautiful. The views are incredible. We had a magical time and were sad to leave. Thank you for your comments. we are so happy you had a "magical time" on Whidbey Island. We hope that we can help you with your next stay on the Island. The cottage was a perfect spot for a relaxing Canadian Thanksgiving week-end. Apart from two light burnt out bulbs, the place was spotless and very comfortable. It was fairly well appointed with dishes, glasses and cutlery. Thank you for your comments. We are so happy you found a "perfect" spot for your holiday on Whdibey Island. We hope to help you with your next stay on the Island. Thank you for your comments. We are happy you had a "fabulous" stay on Whidbey Island. We hope we can help you with your next stay on the Island. Great little house with incredible view! Beds are a little dated and springy. Better mattress and bedding would be a huge boost. Other than that its a great place! Thank you for your comments. We are happy you had a "great" place to stay on Whidbey Island. We hope to help you with your next stay on the Island. I believe I already replied to a request for a review . but here it is againWe love this place, location, alot . However! The smell of mould made sleeping in that room impossible so one of us slept in the living room. This is a very serious drawback and the item which emits smells to cover the mould smell is completely inadequate as well as unpleasant smelling There were some inadequacies regarding kitchen hardware. Highly recommended is a salad spinner. We also thought it would have been nice to have a few basic spices in the cabinets. We liked the wine but left your coffee. There should be a notice as to when the garbage is picked up and there should be beach towels. Thanks Tara . Thank you for your comments. We are so happy you "loved" stay on Whidbey Island, we have forwarded your suggestion to the owner of the property. We are very sorry to hear there was an odor of mold. We will look into this right away. There was a notice posted for which day garbage pick up is so we will make sure that is re-posted. This rental was just as described, with an amazing view from almost all rooms and the large deck. Yes, the skylight over the bed is bright in the early morning, but it was worth getting up to see the calm waters and nearby eagles. Karen, the property manager was very helpful and quick to respond with internet issue. Thank you for your comments. We are happy that It was "worth getting up to" see the amazing views on Whdibey Island. We hope we can help you with your next stay on the Island. The home was gorgeous! We were in town for a friend's 37th birthday and were able to celebrate in style. We had a lovely stay and enjoyed all the wildlife. We're already looking forward to our next stay!! Thank your for your comments. We are so happy you had a 'lovely" amd "styling" stay on Whidbey Island. We hope we can help you with your next stay on the Island. When stormy, we gazed out the window with binoculars with a drink and a cozy fire. This place is heaven, winter or summer. Private, but close to town. Adorable house. May we buy it??! Thank you for your comments. We are glad you had such a great stay on Whidbey Island. The home is not for sale but you are welcome to stay and we"ll be glad to help you with your next stay on the Island. This place is awesome.The location and setting are perfect. The home is clean and takes full advantage of the views, which are panoramic. My husband and I saw Orcas migrating and feeding, and it was the first time we actually heard a bald eagle in flight because it was so close. Our only regret is that we couldn't have stayed longer. We are anxious to rent this wonderful home again. Thank you for your comments. We are happy that you had such an enjoyable time on Whidbey island! We are glad it was "perfect", and you were able to see Orcas and heard the bald eagles. We hope we can help you with your next stay on the Island. This property was as advertised. Clean, comfortable, quiet and the perfect place for our vacation. We loved having the gas fireplace. Thank you for your comments. We are happy you found a "comfortable and perfect" location for you stay on Whidbey Island and the fireplace does add to the enjoyment of the home. We hope to help you with your next stay on Whidbey Island. We stayed 2 nights at the property. 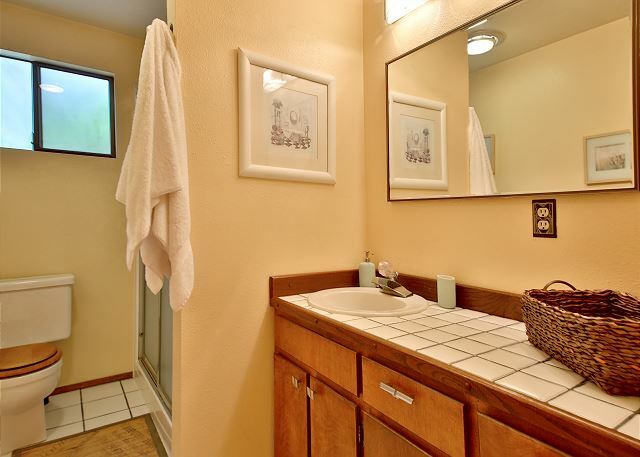 The property was very attractive and comfortable with one problem addressed by the property management. Great deck for relaxing and sightseeing. Location was good, near Langley for shopping and restaurants. Weather was perfect, good visibility of Mt. Hood and the Saratoga Passage. Beach is quite a walk by road, not accessible directly from the property. Thank you for your comments. We are happy that you were 'comfortable" and "relaxed" with your stay on Whidbey Island. We hope we can help you with your next stay on the Island. Well-appointed and beautifully designed house. Located in a tranquil setting with a beautiful sea view. All of the amenities of home with nice appliances and comfortable furniture. Loved the huge deck. Extremely good value for the price. Would definitely stay there again. About a 15 minute drive to shopping and restaurants. Thank you for your comments,. We are happy you "loved" the deck and would "definately" stay there again. Please let us help you with your next stay on Whidbey Island. The house is lovely, the view wonderful -- everything clean. However, it was very hot when we arrived and we discovered that there are very few windows that open -- most are picture windows. It was a bit uncomfortable while the hot weather lasted. Finally, there is no umbrella on the deck which would provide some shade. A lovely property. Thank you for your comments on your stay on Whidbey Island. We have address your concerns with the owner of the house and will see if we can open some windows for the next guest. We hope to help you with your next stay on Whidbey Island! Great house with amazing view! We loved this house for our weekend on Whidbey! The house was perfectly comfortable for 2 grown couples and a dog. The bedrooms are simple and nice, the kitchen has everything you need, living room was cozy, and the deck is absolutely amazing! As other reviewers have stated - the pics do not do the view justice. The directions given were perfect, and we had no issues while we were there. The only thing to note that is not clear from the pictures, is that this house is very close to the neighboring homes. Didnt bother us though! Thank you for your review, we appreciate your feedback and look forward to your return to Whidbey Island. So glad you enjoyed the location, the view, and the home! Thanks for your review! We enjoyed our stay at the Days and Waves. The location is not close to Langley, but allows for amazing water views. The neighborhood is quiet and houses are close to one another. Except for a few carpet stains, the rental was generally clean and comfortable. We're glad that you enjoyed your stay and that you enjoyed the views! We have had the carpets taken care of since your stay, thank you for mentioning that. Thanks for your review! Gorgeous view. Very comfortable house. Thank you for your review. We do have some fabulous views on Whidbey Island. Glad you enjoyed your stay. We really enjoyed our stay! Tucked away in a quiet neighborhood with a beautiful view! House was clean and comfortable for all of us! Thank you for your review. We're glad you enjoyed your stay and this home. 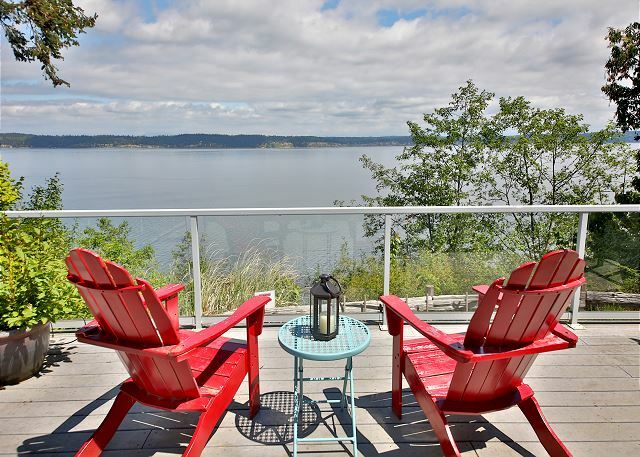 Our views are great on Whidbey Island. Beautiful views of the water from all the front facing rooms. Quiet, nice neighbors, well maintained. Wonderful! Thank you for your review! We're glad you had a nice stay. We hope you'll come stay with us again! We had a really relaxing quite weekend watching the water. We appreciated being able to have our dog there & being able to request a later check out the day we left. Everything was very clean and in order. The only thing to suggest is to have a couple of board games or decks of cards around. We rent a lot of different cabins and I have got out of the habit of bringing cards because most places seem to have them. The hill down to the beach is pretty steep but if someone has a bad knee or something there is room to park a car if you drive. Its not very far though. Less then 1/2 mile and a good work out if you are up for it. We loved our stay! Thank you so much for your review. Nice to hear you had a great time. One of our top priorities is cleanliness. This place is beautiful. We watched Eagles from the deck and enjoyed the amazing view. Can't wait to return. Thanks for your review. We have lots of eagle to watch on Whidbey Island so we're happy you got to see some of them. This house was perfect for our family of 6 & the dog. We loved the view from the deck and enjoyed walking down to the beach. We were a little nervous at seeing the steep hillside from below. Erosion will eventually take it's toll. We're glad you enjoyed your stay. Thank you for your review! Thank you so much for your review and feedback. The owner has just installed a queen bed in the 2nd bedroom :) We provide a starter supply of paper towels and toilet paper for each guest and there should be extra garbage liners under each liner in each garbage can in the house. We are sorry for any inconvenience caused from this. Thanks again! A few girlfriends and our dogs went away for the weekend. The house was comfortable and cozy. Great views!! The beach was a little further than we thought, having to walk down a large hill, but that wasn't a big deal since we planned to go to the off-leash dog beach anyways. House is equipped with everything you need. The only down side was the bed in the second bedroom was actually an air mattress. We weren't aware of this ahead of time but we spent most of our time out and about. Property management company was super accommodating and quick to respond. We'd definitely come back. So glad you enjoyed your stay! The owner will be adding a queen bed to that room soon. Thank you for your comments and for your review! We stayed for 2 nights with our toddler and two dogs and had a wonderful time! The house was beautiful, everything was clean, and the view was beautiful. Very peaceful, spacious, and well kept home only a few miles from downtown Langley. Cute and Cozy home with fantastic views!! My family of 4 stayed at the 227 Days and Waves Beachhouse for 2 days recently and had the best time! The home was clean and decorated very cute and included every feature needed to have a comfortable stay. The location on the island is peaceful and the short walk down the hill to access the private beach area is very close! 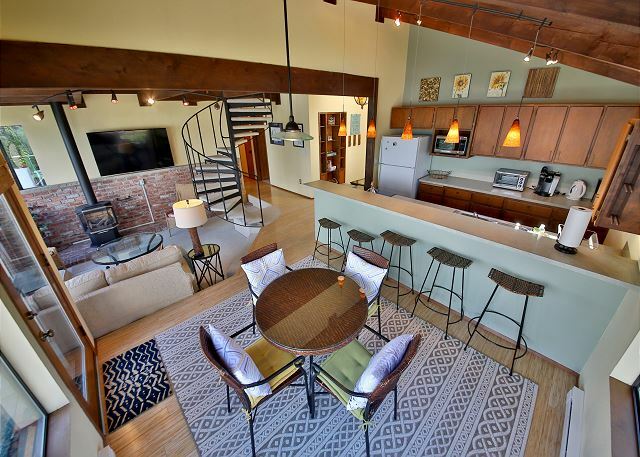 My teenage children LOVED the loft area and flipped a coin for who got to stay in that room. The property feels very private and has beautiful outdoor space to enjoy. My family has already suggested we rent it again during the Summer so we can do some kayaking. 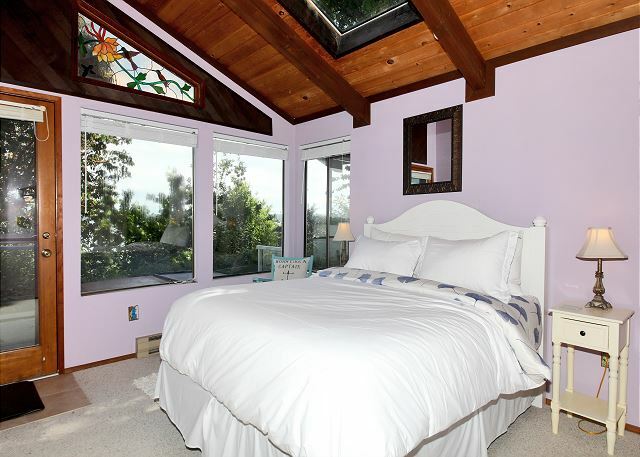 I would recommend this home to anyone looking for a relaxing vacation accompanied by extraordinary views! Oh and there are LOTS of birds to watch from the property also!! And it is pet friendly! Thank you for all of your comments! We appreciate your review! Property was beautifully landscaped. Our dogs were allowed and I took care in not letting wet paws inside. Bald eagle in tree. Amazing views. Quiet neighbors. Home was cozy, charming and warm, very neat and felt like home. If I ever come back to this area I would seek out this place. The walk to the beach was about 5 minutes and about 10 minutes back to the house. Had no issues whatsoever. Thank you for your comments! We're glad you enjoyed your stay! We really enjoyed the feel beachy feel of this home. It had great views and a lovely deck. The loft area was so cozy to sit and look at the sound or read a book. The decors was charming. We love it's location; easy to access Langly, Freeland or Greenbank. The price was also very reasonable! We loved this place. Great location and the view was even better. Walked down to the beach and even had a bald eagle land in the trees right near the house. We spent four nights at this cottage and had the most amazing time. This is the first vacation from which we both didn't want to return. We're so glad you had a great time! Thank you for your review! Our experience was great. The pictures do not give the views here justice, they were incredible. We lost power for about 36 hours but we stayed and were so happy we did. There was a gas stove for heat and a propane Weber grill that we could cook on. The peace and quiet was just what we needed. The house is quite comfortable, clean, well maintained and the room upstairs with all the glass was phenomenal. Got to see Orcas and even a gray whale spouting. The rental property managers were exceptional and did everything they could to make our stay comfortable even with the power outage. The kitchen, living room, dining area and that room upstairs are lovely. Wish the bed was a bit more comfortable but it worked. Our dogs loved it. We will stay there again. Thank you for your review! We are so sorry for any inconvenience caused by that power outage. We're grateful that things were able to work out. Thank you for all your comments! We're glad you enjoyed your stay. We enjoyed our weekend stay here in mid-February. The house is in a great location -- a quiet lot set back from the street with views of the water and mountains. It's just a 10-15 minute drive from Langley and a short walk to the beach. The house itself is cozy, but the decor could use some modernization. There were just two of us and our small dog, and the size felt just right -- it would be a bit cramped with more than four adults. We brought our own DVDs, but the house has its own selection to choose from, and they even have an Apple TV, which wasn't described in the listing. The kitchen was well equipped, however it could use some new chef's knives -- our only option for chopping vegetables was a dull paring knife or a chef's knife that was bent at the end. It would have also been helpful to know that the house has a Keurig in addition to its regular coffee maker. Overall, we had a great stay and would definitely stay here again. We're glad you enjoyed your stay! Thank you for your review! We will definitely look into updating the knives. Thank you for the suggestion. Really like the house the location and especially the view. Enjoyed working the property management. One of the easiest to work with, and we've worked with quit a few over the years. Our only issue, thought not anything to keep someone from renting this lovely place: We never used the beach access, simple because if made us uncomfortable having to potentially lie to a person we might meet that we where visiting someone when we were not. Since we never really did anything more than sleep there I think I would have chosen a hotel next time as the excess fees made this surpass what normal people would consider affordable. Thank you to the renter for these comments. Please know that all renters are allowed beach access and you only have to say you are staying at the home of the owners to get into the beach. You do not have to say you are visiting anyone and no lying is involved! This is common practice for beach rentals and the association has already given its permission for this usage. I am sorry the renter misunderstood, and could easily have made a simple phone call to clarify if a question existed. It is a great beach and would be a shame to miss out on that. Also, rarely can you cook your own meals at a hotel. We loved our stay at the Beachhouse. It was so nice to find that the home was exactly as pictured. It was a lovely experience and it didn't matter that it rained with the amazing view! Wish we could have stayed longer. Thank you! So glad you enjoyed your stay. Thank you for your review! We enjoyed the holiday with our family. The home setting and location is ideal, and the views are fantastic. Will definitely be coming back! This is a lovely and cozy home with a tremendous view. We enjoyed the resident eagle and raccoon family. We visited the Wineries on the Island as well as the Distillery. Enjoyed cooking one meal at the home. We have stayed in a number of Whidbey Island properties in the past 20 years so have some input regarding amenities. We know this isn't an Inn, but we were surprised that there wasn't at least a complimentary basket of bar soap/shampoo/conditioner. The complimentary soap was so very small. The outside porch light plus the driveway lights were burned out. It was difficult to get around when we first arrived. We've never had to sign a 3 page contract. We understand the protection it provides for the property owner, but is very impersonal for the renter. We were surprised by the 4 p.m. check in and then $ per hour if not out by 11 a.m. Again, very impersonal. The info on the refrigerator for the Wi-fi was difficult to read. We are sorry for the inconvenience of the lights and are happy to say the outside lights have been fixed. We now have numerous garden lights on a dusk to dawn setting as well as motion lights on the side of the garage and the front of the house. The complimentary bar soaps have also been upgraded, and the WiFi password has been added to the check in packet :) thank you for your feedback! The cabin was cute and clean. Great location on the cliff. Beautiful views. Only thing it is really a 4 person cabin very difficult for 6. Only 2 beds couldn't find the extra air mattress until 3rd night because it was in attic. She really needed that info but otherwise amazing stay. Very clean and comfortable. Excellent views. Quiet area just minutes from shopping and restaurants. Nice small home, doesn't sleep 6. Lovely small home. Beautiful view. Close to town and wine tasting rooms. Fairly well equipped kitchen. Lovely grounds. Nice beach access within walking distance. Main bedroom is nice, second bedroom has a blow up bed and there are no other sleeping accommodations unless you like sleeping on small, dirty couches. Does NOT sleep six. Sleep 4 at best, unless like my husband you're over 6 feet and take up a standard queen diagonally, then it sleeps even less. I would say is safe to say this home sleeps 2 to 4. Also, the home had several burned out lights. 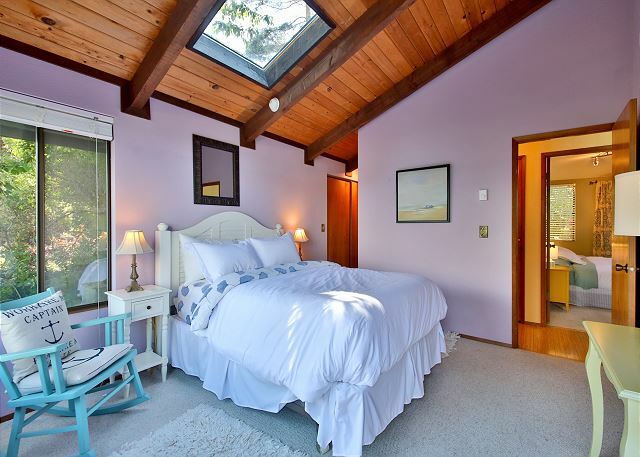 This house has a Queen Bed in the master bedroom, a queen aero bed in the second bedroom which is always made up and is adjustable for firmness, and an additional aero bed in the loft that can be made up for extra quests. There are no sleeper couches, but a number of guests have used the air bed in the loft and a number of groups have had up to 6 people. What a welcoming, lovely home! We are a family of three and could enjoy both togetherness and solitary pursuits. 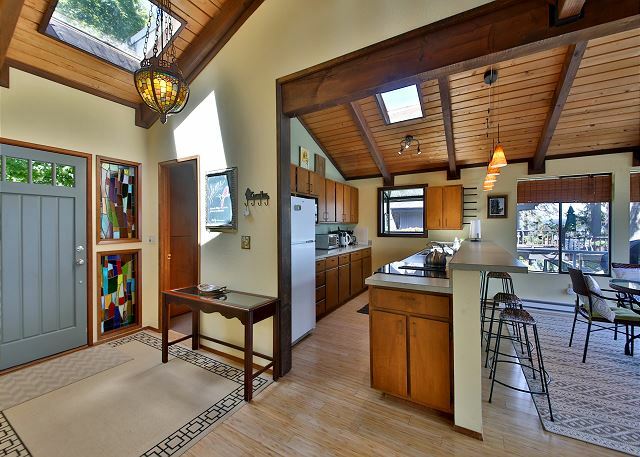 Loft and large deck were perfect for enjoying the fantastic water view. Kitchen was well stocked. Bedrooms cozy. What Bob liked was that all of the technical pieces (TV, DVD, CD, etc) worked well, and were well thought out .... by a home owner... Perfect. Shabby Chic and Cozy place with a great view! Perfect getaway in a quiet neighborhood about 10 min. drive to downtown Langley. 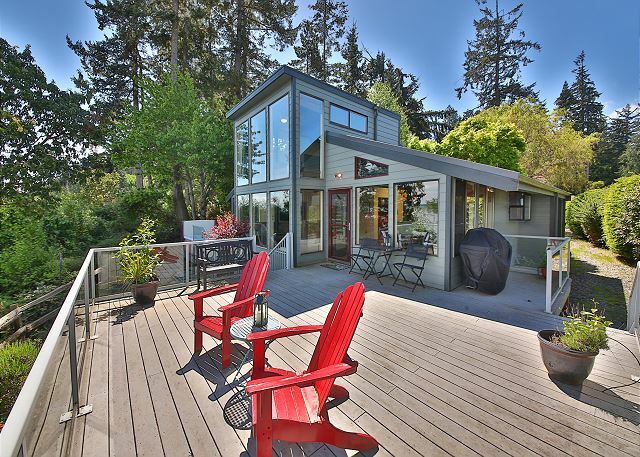 This house has had lots of recent exterior work and has a lovely, large deck. We could have just sat on the deck overlooking the water all weekend! The only things this place needs to be truly perfect are some interior updating (kitchen and bathrooms are very dated) and some additional kitchen items (only two wine glasses?!). The exterior porch light appeared to be on a timer, but it was on all day and off all night, so something is amiss and we could not figure it out. We know the hot tub was not advertised, but it would be nice if it was just removed altogether if the owner has no intention of repairing it. It's an eyesore and a waste of deck space off the master. All in all, however, it was a great place and we very much enjoyed being able to have our well-behaved pups with us. Excellent property in a gorgeous location. We stayed here for 5 nights in late August 2015. The house is beautiful and just as described in the ad and also just like other's have described it in their reviews. It was the perfect for our family of four. Waking up every morning to the sun drenched (east facing) house was lovely. I am a sucker for water view homes and this was no exception. The expansive view is truly fantastic. The house was clean and well stocked including a nice bbq grill on the patio. And we loved grilling our meals daily on the patio. It is exceptionally quite here in this part of the island and I just felt instantly relaxed. As a family we loved going to the beach every morning. Yes, like others have said the walk down and up is a bit of a workout. So be prepared for that. But it is still a very pleasant walk. Our dog loved loved running around on the beach as well! Langley and Freeland are both easily accessible (10-15 min drive). The house has a well stocked DVD collection too, so we spent few evenings watching movies. I recommend this house highly. And the property management company (Tara property management) is excellent. I had some minor concerns and they sent out the property manager right away and sorted it out. Note: this may not be an issue for a lot of people but thought I would let people know. I like a very firm mattress, however the mattress in the master was quite soft for my tastes but that did not ruin the vacation in any way. My husband and I have stayed at several properties on Whidbey over the years, and must say this was the best thus far. The beach house is located on a bluff with a spectacular view, loved the sun deck, and the interior is lovely and tastefully decorated. A perfect get-away home if you want to be surrounded by beauty and peaceful surroundings to relax and rejuvenate! Five adults and a couple of dogs. We really enjoyed our stay here and would highly recommend it. Peaceful, clean and the views were beautiful. It's really only meant for four adults sharing beds, but we took mattresses and our two adults kids slept in the loft. We thoroughly enjoyed our 5 day stay in July. The weather was absolutely beautiful as well as the view. The deck was so relaxing & so peaceful. Had a minor problem with the stove beeping but we used the toaster oven & the grill most of the time. Tara Properties was helpful in sending out maintenance to look at the stove & Melanie from their office was so kind to deliver a pizza for us. Looking forward to renting this lovely home again! 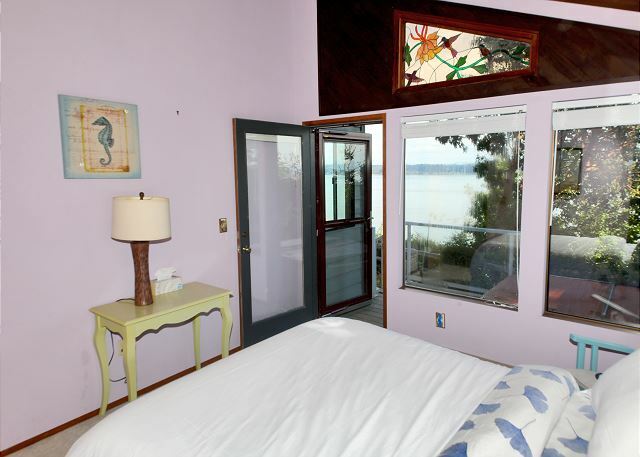 The Days and Waves beachhouse has an expansive view of Saratoga Passage. It was a beautiful sight while having happy hour on the deck. 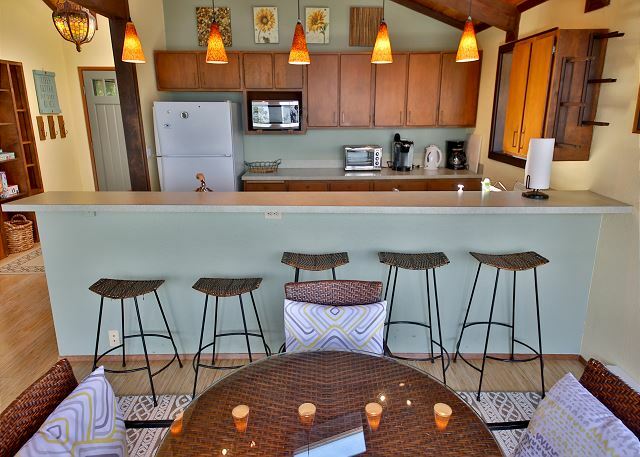 The house was comfortable and well maintained with the feel of a two bedroom beach condo. 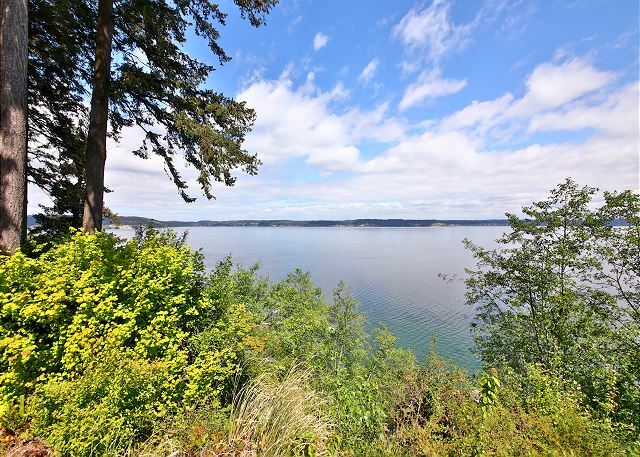 My husband and I love visiting Whidbey and the location was convenient to both Langley and Coupeville. The water view from the house is wonderful, however, the beach is quite a long walk down the road. We spent three nights at this charming house on a bluff overlooking the water. We especially enjoyed the eagle who flew past us every evening and the deer who wandered past. Our three kids loved the nearby beach and even found a tire swing they spent hours on. We had a great time and can't wait to come back! This house was so pretty. The beds were comfortable. We loved the fireplace in the mornings when it was cool. The deck provided beautiful views. We saw bald eagles several times. The plants and trees around the house were lush and beautiful. The only complaint I would have was the house had a musty smell probably due to the fact most windows didn't open. I really would only notice it when we would first come home from being out. Then I wouldn't notice it much. All they need to do is put some air fresheners in the house to give it a better smell. But other than that we really loved staying here! This beach house worked for what we needed. A nice weekend get away with a few of our friends. Although I would call it more of a beach cliff dwelling house. The beach is not as close as implied. You just have to go to the street and down the hill to get to the beach. We made at least one trip down there each day. The weather was fantastic when we were there so sun bathing on the deck was perfect and flying kites on the beach was a blast. There is a house pretty close to this one on one side although the other side is very private and has a little trail along the cliff you can wander. We ended up putting a hammock between 2 trees on the private side. A curtain for more privacy in the dining area would be nice since the neighbor house is so close. And a few more blinds especially in the loft for the people who sleep up there. It would have been great if the hot tub was working although we knew it wasn't working before our stay. It says this house sleeps up to 6 people but there isn't a 3rd bed so it was a good thing we brought our blow up mattress and extra bedding or a couple of us would be out of luck with a sleeping situation. We also brought a few camping chairs and a camping table which came to be useful when all 6 of us sat down to eat dinner. This house definitely had enough space for the 6 of us although it is really only set up for 4 people. Overall, we had a great stay and the Management company was nice and easy to work with. Very comfortable. Great views. The hot tub hadn't been repaired yet. It was just what we needed. Everything was great, except that it was somewhat misleading as to how close to the beach we were. We thought we would be on the beach, but instead had to walk or drive a distance to get there, and even then, it was unclear as to whether we (as guests at the property) were allowed to be on that beach. Other than that confusion, it was a wonderful stay and we would definitely return! It's a beautiful and peaceful house with fantastic views, exactly what I wanted and expected. It runs a little thin on kitchen equipment and supplies, but all of the basics are there. The views of Saratoga Passage are incredible. The beach is a little inconvenient to access. It's probably a 1/4 mile down a steep hill (which means a 1/4 mile walk back up). A short, 5-10 minute drive to Langley. We enjoyed our stay; it would have been great to have information about the neighborhood (how to get to the beach, tide tables) and area (info about Langley--stores, restaurants, fun spots). Also need to replace the front porch light bulb. Appreciated being able to bring my little dog! This rental was super clean and comfortable with a beautiful view and a cozy propane stove in the living room. The kitchen was good size but the utensils and cooking appliances could be a little more useful if you really want to make a meal there, which my family did cook 1 dinner and 3 breakfasts. We could have used more bathroom towels as we had to do a load half way through our stay,and the beds were a little too much on the soft side for us, but overall we enjoyed the home very much. We were very disappointed that the hot tub did not work as we always chose homes that have a view or beach access with a hot tub. We were not told until a few days before coming that the tub did not work. Some money off the stay would be approriate and much appreciated. The home is a lttle bit of a drive to Langley and Coupeville and Ft. Casey State Park but the home is very nice and there was an eagle who stayed most of the time up in a tree at the neighbors house. He was magnifcient! We want to thank this renter for the feedback! We are sorry for any inconvenience caused to them. We do leave enough towels for each guest plus a few. The hot tub at this home has not worked since it was made into a vacation rental. There has been absolutely no advertising that there is a hot tub. It is not listed as an amenity and there are not fees charged for hot tub maintenance. So we are not sure why this guest thought there was a hot tub. Once you get to the house, you can see the hot but, but it is empty and we do supply instructions in the check in packet that it is not working, as well as at the house. We hope to have the hot tub working in the near future, but do not have a date as of when that will be at this time. We hope all will enjoy this beautiful home and location!! We also welcome any calls during your stay if a guest needs something (like a kitchen utensil), we may be able to get it for them. We encourage you to call with any questions or problems so that we can promptly fix any problems. Thank you!